Anna University Revaluation Results 2018: COE declared Anna University Revaluation Results Nov Dec 2017 (Phase I) today. Students can check Anna University Nov/Dec 2017 Revaluation results published at coe1.annauniv.edu and at 2by2results.com Anna University Revaluation Results Nov Dec 2017 will be declared on aucoe.annauniv.edu. As we all know that, Anna University Results for Nov Dec 2017 Exams were declared on 29th December 2017. Students received the Results through SMS as well as Results were published on coe1.annauniv.edu, coe2.annauniv.edu, aucoe.annauniv.edu. By entering the Register number along with Date of Birth, Students can fetch their results.Use below link to check Anna University results Nov/Dec 2017. 2by2results.com will provide Updates regarding Anna University revaluation results Notification in this page. We request Students to follow our page to get regular Updates. We will provide tentative dates for Anna University revaluation results Nov/Dec 2017. Students who wish to apply for Revaluation can apply for revaluation on or before 5th January 2018.i.e To get Photocopy of the answer Sheet Students should pay fees before 05-01-2018. Web Portal is opened for Applying Revaluation of Answer Scripts for Nov/Dec 2017 Examinations (Except First Semester - UG/PG). Colleges can apply Revaluation. Last Date for Applying Revaluation is 30-01-2018. Web Portal is opened for Applying Revaluation of Answer Scripts for Nov/Dec 2017 Examinations (Only for First Semester - UG/PG). Colleges can apply Revaluation. Last Date for Applying Revaluation is 09-02-2018. Anna University Revaluation Results Nov Dec 2017 expected to be announced by around 20th February 2018. 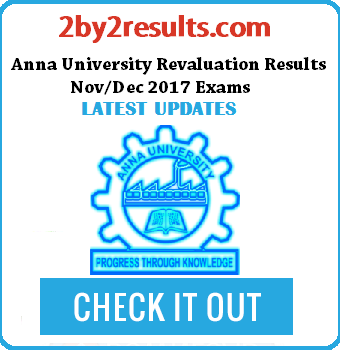 Anna University Revaluation Results Nov Dec 2017 (Phase I) announced today. Anna University Revaluation Procedure 2018 | How to apply for Anna University Revaluation results Nov Dec 2017? Students need to pay Rs 300/- (for each paper) to get Anna University Nov Dec 2017 Exam Answer Sheet. This is related to Phase I Process of Revaluation Results Nov/Dec 2017. Then, Anna University will send the photocopy of the answer sheet to respective colleges for those colleges for those students who have paid the fees. Then Students need to pay Rupees 400/- (for each paper) If they wish to apply for revaluation results. Hence, This is an option for the Students. If they feel that, they can improvise the results, they can get acknowledge from respective subject staff and apply for Phase II revaluation. The last date to pay for Anna University revaluation results (Phase II) will be declared in the Coe1 portal. The above Revaluation Procedure is common for both UG & PG Students. 2by2results.com will provide notification regarding Nov/Dec 2017 revaluation result date for both UG & PG students. Check below Table to get Nov Dec 2017 Revaluation result date.